Scattering processes affect electron dynamics, transport and quantum confinement. Hence, understanding the mechanisms behind different scattering phenomena is of paramount importance both for fundamental knowledge and the design of novel electronic nanodevices. This is particularly crucial in recently discovered 2D materials such as graphene and topological insulators, where scattering is characterized by the entanglement between orbital momentum and pseudospin (in graphene) or spin (in topological insulators), resulting in exotic charge and spin transport properties. We investigate the scattering phenomena in 2D systems using quantum resonators with controlled geometry, such as nanoislands or atomic steps. Based on the earliest analysis of STM interference patterns, steps and metallic adsorbates at (111)-oriented surfaces are frequently assumed as canonical hard-wall potential barriers, on which surface electron waves undergo substantial reflection and absorption but negligible transmission. In contrast, angle-resolved photoemission (ARPES) experiments, performed in the ordered step superlattices of vicinal (111) noble metal surfaces, have repeatedly shown dispersing bands with clear signatures of weak repulsive scattering at steps, namely small size effects and narrow gaps at the Brillouin zone boundary. This behavior is only compatible with a high transmission coefficient across the step barrier. But, why does the step barrier strength change that much when going from a defectlike, random step, to the staircase of the vicinal surface? Previous ARPES experiments on vicinals surfaces with different terrace-size suggested the existeance of a transition from dispersing superlattice states to strongly confined quantum well states as we increase the terrace size. However, different experiments pointed to disorder effects as responsible for the transition to strong confinement. Order vs. disorder in the electron scattering of (111) noble metal surfaces. (a) Schematics and picture of a curved vicinal single crystal. b) Superlattice band dispersion of the surface state and STM image of a curved vicinal Au(111) surface. c) Left: The potential obtained for step superlattices on different noble metal surfaces by fitting the dispersing bands with the Kronig-Penney model. Right: STS spectra acquired across a pair of isolated steps on Ag(111) reveal the formation of confined states at energies that correspond to an infinite potential well (horizontal dashed lines). The wave function of each case is sketched at the centre. 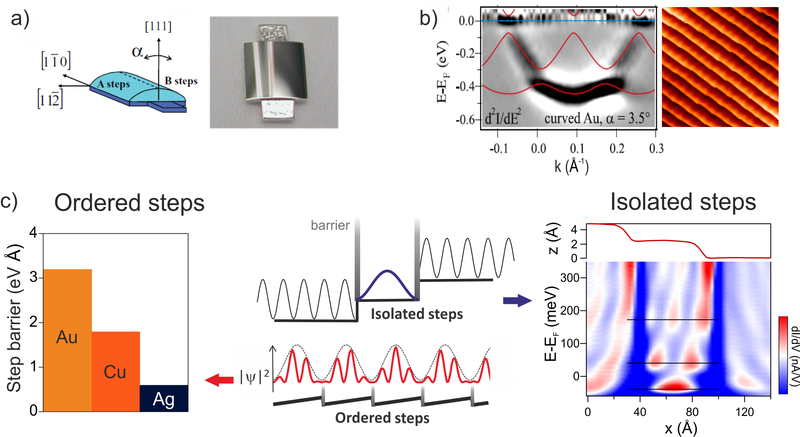 In order to solve this puzzle, we have combined STM spectroscopic measurements in isolated terraces with ARPES experiments on a special type of vicinal surface, a Ag(111) curve surface [Phys. Rev. B 87, 115425 (2013)]. Here, a high quality superlattice periodicity smoothly varies from 10 up to 200 Å, allowing us to study electron scattering varying the terrace size over one order of magnitude. We observe dispersing superlattice Bloch states for the whole range of step periodicity, with energy shifts corresponding to a weak potential barrier of 0.6 eV Å. On the other hand, the energy of the non-dispersing resonant states measured by STM on isolated terraces can be compared to that of infinite quantum wells, indicating a negligible transmission across steps, and suggesting that disorder and decoherence rather than a terrace-size dependent transition is the responsible for the strong quantum confinement observed in some vicinal surfaces.